Today they had provided Alex as an Umpire throughout and so Scott and Leo bore the square leg duty throughout our batting innings which was first. Manish actually took first strike and Leo faced in second over. Regrettably it did not bounce as expected and getting down to it lifted it to waiting hands and credit to Shakil Ehsan playing his second match with Merton. Neil picked up and was connecting very well with every scoring ball a boundary apart from one single and one three. Manish was finding the markers too. On Neil sending a fine 6 the ball was lost in the trees for a long time despite many searches and it was some 30 minutes later before Stuart came out with the prize, though he did have a brief spell before that being bowled superbly by on form Holmes. Back to the game and replacement ball, Neil was looking good for a feature score but Holmes got one that again had unexpected bounce and it finally swept through and 34 in 28 minutes. Following Stuart was Mahender who had a more cautious start before opening up and falling to Holmes as well. A swift 15 kept our score respectable. Next up was Newton who did not truck with dot balls but then was given a dubious LBW off young Milton quite forward of the crease, 10 added all the same. 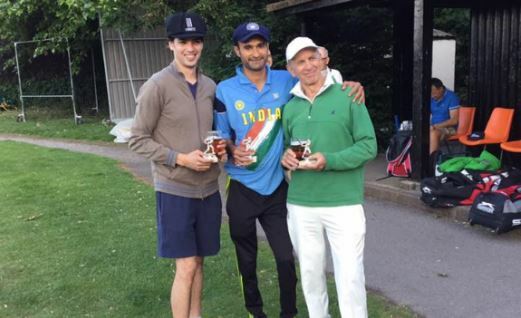 Matthew was higher up the order and although seeming a tad nervous played fine strokes including a boundary and was also kept running as Manish was racing towards a classy 50 in 60 balls over 95 minutes. Vaughan was bowling economically and he sent a ball clearly bouncing high but Umpire awarded LBW again and so Matthew was gone for 11. Before Scott could make any impact, Manish hit the ball and was deftly snatched at Mid On but nonetheless it was a lovely 51, amazingly the first time he had passed 50 for Graces despite many prolific innings. Mamun came in looking for 50 too and immediately hit a fine boundary to Deep Square Leg forcing them to adjust placings. He also hit a 4 on a no ball that was head height but with young Jonathan Milton bowling, a developing player since last year, he too was awarded LBW and scored 10, three wickets then for Holmes and Milton. Scott was now on 3 as Asad came in. Although some good connections they had sharpened their fielding except several fluffed opportunities to run out as the wicketkeeper did not maximise returned balls, we were looking like we might just reach 180, being at only 171 when Asad was wide open to returning Smithers and had 9 on the board. So our last pair was Scott, now on 13 and Yousuf. Scott now took the mantle and regularly had boundaries and Yousuf backed him well, so much that they played the match out with a 47 partnership and a score of 218, Scott now second highest on 39 and Yousuf fourth with 19. In our innings, there were many dropped catches but also the highly contentious decisions, still we had set a decent target and our bowlers were numerous although Scott would keep wicket the whole of their innings. The lady who does teas at Merton had once again laid an ample spread with many sweet delights and it was appreciated by all, especially as some players had children attending. As well as Anthony and Augusto giving support, there was a large stuffed panda named Boo and we were being photographed and interviewed for an article potentially to reach the Guardian based on their Sport for All series. Newton and Mamun opened the bowling against Jack and the lumbering Crawford with good overs and then in the 6th, a Wicket Maiden, Asad caught a shot well at Backward Square Leg and Crawford was gone for 6. It took another 6 overs to dislodge Jack who reached 20 and it was now Asad and Mahender bowling. Mahender sent a ball with gusto and Jack was no giant but he was down low and the ball seemed to strike his helmet yet was awarded LBW. A lot of fuss made by their team over their Umpire – already recognised some of our dismissals were not easy to understand – but their Captain chose not to ask Mahender to withdraw from Wicket given and so Bawn was in to accompany Graham Bradfield who had set to escalate the run rate but Bawn managed one before a fine slip capture for Leo off Mahender. Effective Bowler Holmes was hoist on his own petard and Asad took him nicely on his 4th attempt to score. As mid innings drinks approached it looked like Graham wanted to outdo Manish but in the resumption over he went for 47 as Asad was deadly yet again. Joe Gunn had hit a fine 6 with Stuart close on fielding it and another ball search off Mahender but it was Bob Egan to fall next for 2 and a third bowled wicket for Asad. At 96-6 their resolve was faltering. Neil was bowling and took two fine catches off the strike for little loss. It was only Joe keeping their score alive. Neil then whistled through Joes defence to get a third wicket and dismiss him for 39 and the score 139. Shakil had played a couple of well thought boundaries but on Yousuf being given the ball his third delivery was a beauty and that was it, Shakil on 13, the score at 143 and Neil Simpson, their captain, had just reached 5 not out. A comprehensive win and once again fine teamwork. Our Bowlers had no slack and virtually nothing got past the gloves of Scott. Once again there was no shortage of claims for Man of the Match. Was Yousuf late Wicket and late opportunity runs enough, or late partner and wicketkeeper Scott. Asad had a full 8 overs to be 24-3. Neil had three wickets too for 16 in 4 and a fine knock. His decision was to applaud Manish for his score who also was tight at 16 in 4 overs bowled. Trophy duly given, there were trophy catch ups for recent winners Matthew and Neil. Manish generously bought a jug plus of beer for those not dashing off. Should not neglect our other bowlers as all made impact. Newton was 17 off 5 overs, Mamun 20-1 in 4. Mahender 22-2 in 4. Matthew was 20 off 4 overs. Next week is back to Greenford with Southall Dragons our opponents. Can we keep this strong form going? On seeing the score achieved our far flung regular supporters were quick to congratulate, hopefully many can come along in what seems fair weather forecast.